Solhälla is in Svenshögen about 60 kilometers north of Gothenburg. You can come here with bus or train. Certain times on weekdays there is a bus which stops right by Solhälla. You can write Oskarshem, Stenungsund in Västtrafiks reseplanerare to search for the times. Every day there are trains to Svenshögen. If you walk it takes about 30 minutes from the station. At some courses it is possible to get a ride from someone at Solhälla or from your courseleader (in that case it costs 20 Skr that you give the driver). 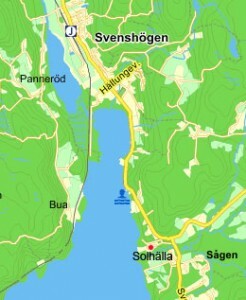 As you can see on this map you follow the lake from the station until you come to an intersection. Turn right there and after a few meters you will see a sign saying “Hällungens kursgård” that points straight down at Solhälla. If you come by car you can get a road description on Google maps by writing the address Solhälla: Oskarshem 215, 444 97 Svenshögen. Below you find some links to maps with road descriptions.